Youth from Dr. M.L.K. Jr. Academic Middle School, San Francisco. The 11th Annual Junior Solar Sprit Challenge was held out doors at the , Lawrence Hall of Science at the University of California, Berkeley, California on Saturday, May 27, 2006 from 10 am to 4 pm on a nice sunny day with a slight wind blowing and making it a perfect day for a great Solar Race. Seven Schools participated in this event organized by the Society of Women Engineers who did a great job. The event was well organized and snacks and cold drinks were provided to everyone. Parents, relatives, teachers, friends, volunteers all came out to cheer and support the schools. Albany Middle School with Coach Bryan Flag led 7 teams. 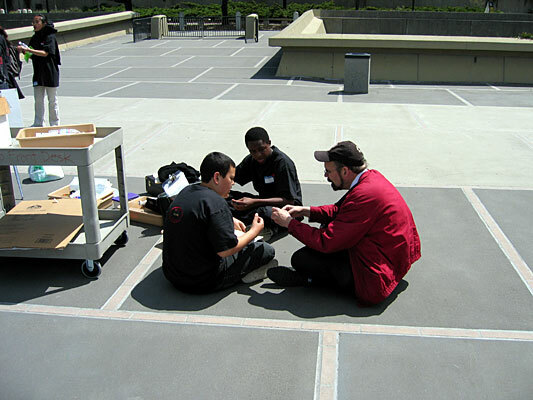 Chabot Space and Science Center, Oakland, California participated with 10 teams and led by coaches Jonathan Hewitt, Gabriel Navarette, Connie Phu, and Alex Sung. Coach Tavie Knapp lead Charlotte Wood Middle School from Danville , California and they had 10 proud teams that participated in this Solar Event. Coaches Pauline Ancell and Herb Ancell led Davidson Middle School from San Rafael, California and they had 2 teams and won the championship - with Samuel Derose and Eric Andow finishing together and sharing the championship. Foothill Middle School from Walnut Creek, California participated with 5 teams and had the support of coaches Mike Sulyma, Mike Capener, and Ajit Pradhan. Coach Louann Talber participated with 1 team and coached Laytonville Middle School, Laytonvill, California. Martin Luther King Jr. 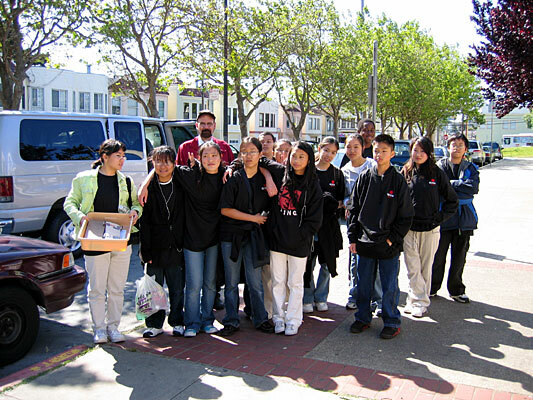 Academic Middle School, San Francisco, California had 6 teams and was led by Coaches Lloyd Schuknecht and James Morrison who also sponsored the school teams. The main objective of this event is to simulate enthusiasm for science, renewable energy and creative think through hands-on design. It was fun talking to the youth and listening to their aspirations. The kids were having fun and yet all the teams worked hard to gear their Solar Cars for a great competitive race. The Lawrence Hall of Science is situated high on the hills over looking the Bay Area and from this vintage point one can see the Golden Gate Bridge, Alcatraz, Angel Island, and so much of the scenic beauty that we in the Bay Area take for granted. On this clear sunny day one could see for miles and one could not help feeling and thinking about our environment and keeping our environs pristine. Solar generates clean energy and it was fitting that we had some of the best young minds racing their Solar Cars using the Sun Energy and proving to all gathered that Solar was the "in" thing today. It was a nice sunny day and youth were having fun racing the solar cars. All the youth were provided the basic Solar Panel, a motor, wheels. The youth used their imagination and creative genius to put together some neat Solar Cars. Prizes were given for engineering and design too. Michael O'Brien from Charlotte Wood Middle School won the prize for best design. Early on his Solar Car has not won the race but I noticed everyone was impressed with his Solar Car's design. He kept telling his father that he had not won but others kept encouraging Michael that he had done well. I do not think Michael was thinking about the design aspect and was surprised to receive that prize and a certificate too. Judges Nate Chang and Travis Massey from CalSol, University of California, Berkeley. James Morrison Bayview Energy Inc. and Mike Seeman CalSol, University of Berkeley had a difficult time judging but all did an excellent job. The volunteers Minerva Pillai, Umber Masood, Ann Sy, Becki Berumen, Zack Mooneyham, Jason Xu, May Chu, Andrew Favor, Hoday Stearns all did a great job keeping everything on track for this Solar Event one of a kind. I accompanied the Dr. Martin Luther King Jr. Academic Middle School all the way from the Portola District in San Francisco to Berkeley. Joining me were Phunong Tseng, Yong Yu Xie, Karen Feng, Roger Vien, Cynthia Diep, Serena Yuen, William Nyon, Kevin Diep, Keoki Parker, Tevita Koka, Jade Zhang, Connie Jiang, Lena Chen, Angela Wong, and Brandon Louie. We also had a Chaperone Barbara Bushnell who provided cold drinks and cookies to the youth. Cynthia and Sandy worked well on one of the team and reached the simi-finals. Another team that did well was led by Yong Yu Xie and Connie Jiang. The girls fared better then the boys but there is always another time and next year is round the corner. I got an opportunity to speak to the parents, the teachers, friends, relatives, supporters, volunteers and those that had come to view the exhibition at the Lawrence Hall of Science. It was a nice sunny day and everyone I spoke to wished we had more events to draw the youth to participate and be creative. The event started at 10 am and soon it was time after all the racing for the Awards Ceremony. Everyone got an award and some little gift. Samuel and Erick were happy to be the overall winners. 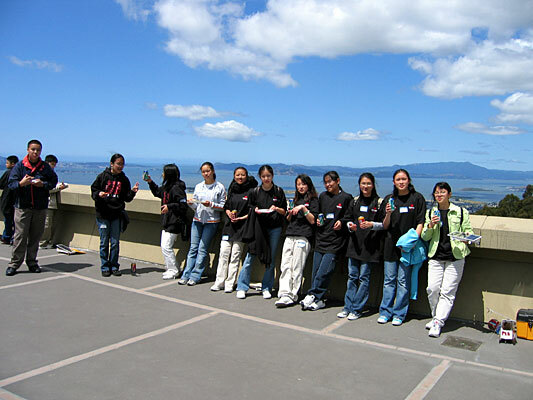 The youth had fun watching the exhibition at the Lawrence Hall of Science free of charge and the girls were busier at the Shopping Center. Soon it was pass 4 pm and we all decided to return to our destination in the Portola District in San Francisco ­ Dr. Martin Luther King Jr. 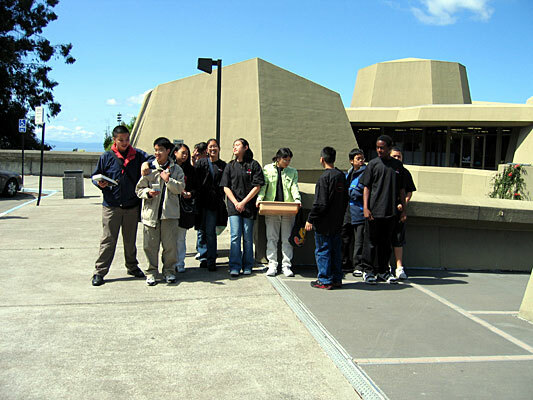 Academic Middle School in San Francisco. Kudos to Mr. James Morrison and teacher Mr. Lloyd Schuknecht. Over all the youth had a nice outing the event was excellent with lots of socializing and everyone looking forward to next year and a bigger and better event. Solar is in and every one is thinking about better and bigger projects to eliminate the use of fossil fuel that pollutes Mother Earth. 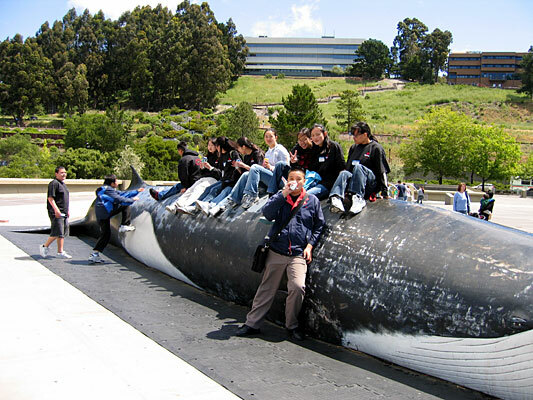 Youth at the Lawrence Hall of Science. 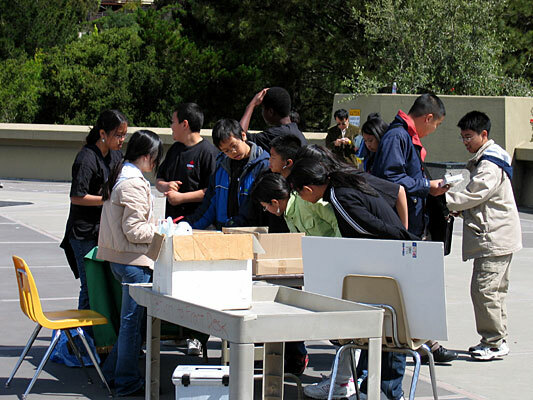 Youth from MLK Middle School in the Portola District.